Scope and Content The Harbour from the Pier, Leith, Edinburgh Originally, Leith Harbour lay around the lower stretches of the Water of Leith. Though the docks were extended out to sea in the 19th century, this view concentrates on the area still known as The Shore. The Shore today is a thriving area, well-removed from the activity which takes place behind the perimeter wall of Leith Docks. 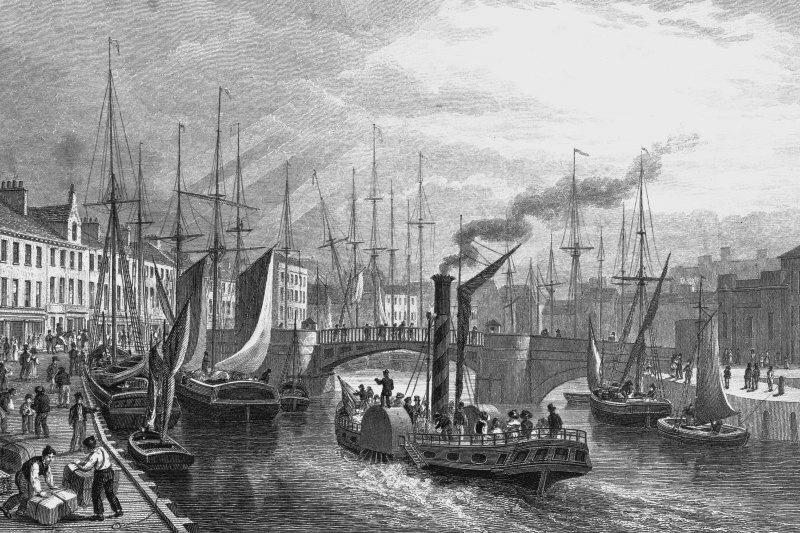 In the 19th century, however, there was much more commercial traffic here, together with passenger boats. The illustration gives a good idea of the bustle of a thriving port. The masts of many commercial boats may be seen jostling in the water on both sides of the bridge. There is much activity on the quayside and the deck of the paddle steamer is crowded. Source: RCAHMS contribution to SCRAN.